Carter Wagner’s autoimmune condition brings him daily challenges. His happiness comes from spending time with his family and listening to Ed Sheeran music. Kids Wish Network, a children’s charity that grants wishes for kids with life-threatening illnesses, planned the “Perfect” wish…he’d be traveling with his family to see Ed Sheeran in concert. Samuel would also be in for a big surprise. Kids Wish Network flew Carter and his family to Boston for his musical adventure. On Carter’s special day, it was show time. After arriving at Gillette Stadium, the excitement for Carter started even before the concert. 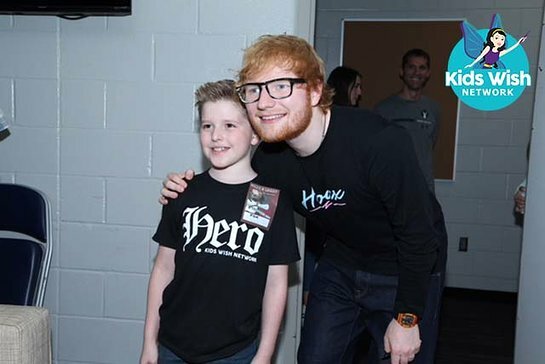 He was taken backstage and met music superstar Ed Sheeran! “I was surprised and nervous,” said Wish Kid Carter. “It was crazy… I didn’t think I’d ever be meeting him.” Carter found out just hours before the show. During the wish, the family was indulged at the elegant Battery Wharf Hotel, staying in the luxurious Presidential Suite. They also enjoyed festive dinners at Red Robin and Wahlburgers who went out of their way to make his wish experience extra special.